So before I get to High 5 For Friday let me just say this, how on earth did I miss that yesterday was my 1000th blog post? Holy Smokes!!!! This October will make 5 years, and now I've hit 1000 posts. Now let's get to the point here. While I'd love to call this High 5 for Friday in my heart I just can't. My husband's birthday is this weekend and that always signifies one thing... the start of the school year. 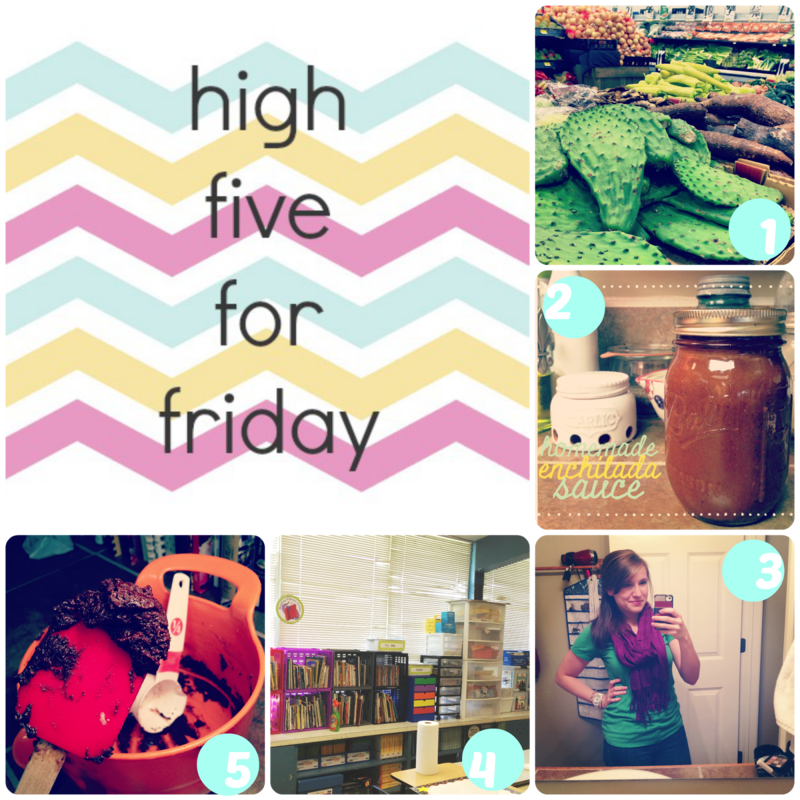 So this week is a not so high five kind of Friday. More like Hot Dang How's Summer Over Already Friday. 1. There is a huge Hispanic community in this town and because of that the Hispanic produce is off the charts. I've been seeing this cactus every week and now have an idea of how to cook it thanks to my culinary student girlfriend. Thanks Kayla! Y'all will be seeing a cactus recipe sometime soon. 2. I made enchiladas this week and ended up with a ton of extra sauce and just couldn't figure out how that happened... well I had less tortillas ha! If you are ever looking for a great enchilada sauce recipe check out The Gracious Pantry, I make this all the time but this week Jeremy look at me stunned that it was from scratch. It's that good! 3. Teacher meetings are in full swing, and the bangs are not growing out fast enough. They are just annoying enough to not go behind my ear and I am not 100% on the pouf now that I have heard students call it the Snookie pouf. Home girl needs to learn to French Braid some bangs ASAP! 4. My classroom is coming together, I'll post more on that once it's totally done. It took a lot of cleaner and a lot of time but the atrocious shelf from Haidas has been conquered. That shelf had garbage stacked up to the ceiling and the teacher who was there last year refused to touch it, it's from the teacher before. I just can't deal though and had to tackle it. 5. The old man is turning 29 this Sunday so I started his cupcakes this morning. And yes, I am eating batter for breakfast while I type before I head out to the gym & the school.